Your home is one of your biggest investments and it may be in jeopardy of attack. DID YOU KNOW that termites cause more damage than fires, tornadoes and earthquakes combined? In Texas alone, they cost us hundreds of millions of dollars in damage per year. 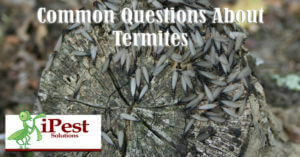 Today I wanted to answer some common questions we are asked about termites. I see flying ants are they termites? Winged ant’s and termites are similar in appearance but, if you know the differences they are easy to tell apart. There are 3 main trait differences between ants and termites we are going to talk about today. 1.Look at the insect’s body. Ants have pinched waists where termites do not. 2.Look at the antennae on the insect. Termites will have straight antennae and ants have elbowed antennae. 3.Termites have 4 wings and they are all equal in length. Ants also have four wings, but their front wings are longer then their hind wings. If I find termites in my home do I need my whole home treated or just the spot where I find them? I always recommend a full treatment when termites are found in or on the home. Termites are often not seen until the damage is found. This can be in between wall voids, behind cabinets and even under tubs and sinks. If you find a spot where termites are feeding most likely they are in other spots also. By only treating the spot you find activity you are most likely missing other areas that they are actively foraging. Which is better for treatment, baits or liquids? This is the most common question we get about termite control. Traditionally, liquids were the most common mode of action. The theory behind traditional liquid treatments were to provide a barrier around the home to prevent termites from finding their way in. The barrier would suppress the colony by not allowing termites to penetrate the structure. The problem is, there is no way to 100% provide a perimeter barrier. There are multiple areas where voids will be found especially where you drill in concrete. Also, liquids leach out into the soil. Sprinkler systems, water leaks and rain will break the chemical down over time making the chemical disappear. Also, if you have to dig close to your slab you might dig the chemical barrier away. The most effective day for termite control is on day one. Over time the chemical will diminish within the soil leaving your home unprotected. Baits are a completely different method for treatment. Baits systems work by inserting bait into the ground every so many feet (each product is different) to protect a structure from termites. There are several different bait products on the market. The one I’m going to talk about today is Sentricon. 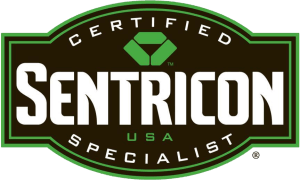 Sentricon is a termite baiting system with a growth regulator that goes in the soil. The bait is placed in tubes that go about 12 inches down in the ground. Inside the tube is a product called Noviflumuron. Noviflumuron is an IGR (insect growth regulator) that prevents the termite form shedding its exoskeleton. When a termite encounters this IGR the worker dies. Because the worker termites provide all the food to the colony, once the workers die the colony dies due to starvation. How do the termites find the bait? Termites forage at random and are found to forage up to the length of a football field. They move around beneath the ground until they find a food source. They will then send pheromone trails back to the other workers once they find a suitable food. Through years of research the producers of Sentricon have formulated a product to mimic Southern Yellow Pine which is what our homes are built of. It has been proven that once termites find the Sentricon system they prefer to eat the bait instead of the wood found in our homes. Once the bait it found the colony is eliminated. These are just a few of the common questions I get on termites. If you have any questions, please feel free to ask! If you would like to learn more about Sentricon and the services we offer please give us a call.